The significance of the arrangement is that it happened exactly a week before the first of four dark red ‘blood moons,’ which some Christians believe marks a cycle associated with the end of the world. Although lunar eclipses happen multiple times in a year during a full moon, this eclipse will be a particularly unusual viewing opportunity for North America. Since the Earth’s Western Hemisphere will be facing the moon during the eclipse, the continent will be in prime position to view it from start to finish. In addition, the eclipse will coincide with nighttime in North America. The entire continent won’t be able to witness a full lunar eclipse in its entirety again until 2019. ‘Sometimes they’ll happen and you’ll have to be somewhere else on Earth to see them,’ said Noah Petro, Lunar Reconnaissance Orbiter deputy project scientist at NASA’s Goddard Space Flight Center. ‘Most [residents] of the continental United States will be able to see the whole thing.’For those who are awake to watch the eclipse, which is scheduled to begin around 2:00 a.m. EDT and last over three hours, Petro said there would be several changes people can witness. When the moon first enters the Earth’s partial shadow, know as the penumbra, a dark shadow will begin creeping across the moon. This will give the illusion that the moon is changing phases in a matter of minutes instead of weeks. ‘Eventually there will be a chunk of darkness eating the moon,’ Petro said. A lunar eclipse occurs when the moon passes in the shadow of Earth. This is an area known as the umbra, where light from the Sun is blocked by our planet. The light refracts differently in the atmosphere and, as it hits the moon, it makes it appear red. 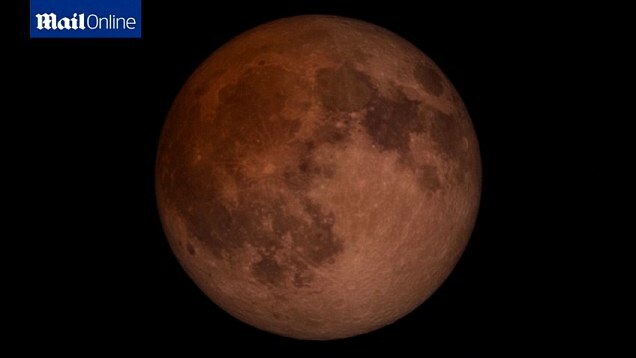 This gives rise to its ‘blood red’ appearance during a total eclipse, when the entire moon is in shadow. If it skirts the shadow, known as a partial or penumbral eclipse, the effect is less dramatic. The eclipse is scheduled to begin around 2:00 a.m. EDT and last over three hours. At the eclipse’s peak, around 3:45 a.m. EDT, the moon will enter the Earth’s full shadow, the umbra. At this stage, the Earth’s atmosphere will scatter the sun’s red visible light, the same process that turns the sky red at sunset. As a result, the red light will reflect off the moon’s surface, casting a reddish rust hue over it. It’s not often that we get a chance to see our planet’s shadow, but a lunar eclipse gives us a fleeting glimpse. During these rare events, the full Moon rapidly darkens and then glows red. Though a lunar eclipse can be seen only at night, it’s worth staying up to catch the show. At the eclipse’s peak, around 3:45 a.m. EDT, the moon will enter the Earth’s full shadow, the umbra. At this stage, the Earth’s atmosphere will scatter the sun’s red visible light, the same process that turns the sky red at sunset. However, some believe the eclipse has larger significance. John Hagee, a Christian pastor who has written a book on the Tetrad called ‘Four Blood Moons: Something is About to Change’ told the Daily Express that Tuesday night marked the dawn of a ‘hugely significant event’ for the world. Also known as the ‘Tetrad’, since it involves four successive total ‘blood-red’ lunar eclipses each followed by six full moons, Nasa has confirmed it started Tuesday night and will end on September 28, 2015. In the 21st century, tetrads are a frequent occurrence, with nine sets in total, but this has not always been the case. From 1600 to 1900, for example, there were none at all. According to Mr Hagee, each time the Tetrad has happened during that time, there has been a significant religious event accompanied with it. In 1493, the first Tetrad saw the expulsion of Jews by the Catholic Spanish Inquisition. The second happened in 1949, right after the State of Israel was founded. And the most recent one, in 1967, happened during the Six-Day War between Arabs and Israelis.